Kick off the 30th Annual Earshot Jazz Festival with a blockbuster double bill at KEXP’s Gathering Space, featuring two hard-driving young groups from the forward edges of today’s jazz tradition. This free event showcases the acclaimed saxophonist Logan Richardson with his blues PEOPLE band (see description, October 7), and the eagerly anticipated return of “dauntingly skilled” Chicago trumpeter Marquis Hill and his Blacktet (see description, October 8). Her highly original soloing, with its sophisticated technique and rich, lush tone, as well as her compelling concepts and delivery, have drawn such plaudits as the prestigious MacArthur Fellowship. Carter took the jazz world by pleasant surprise when she arrived in New York from her native Detroit, where she had played with the youth division of the Detroit Symphony Orchestra. With her stylistic range, she has performed with a long list of jazz greats, including Kenny Barron, Max Roach, Tom Harrell, Wynton Marsalis, and Oliver Lake, and also with artists as diverse as Faith Evans, Elliott Sharp, and Mary J. Blige. Filmmaker Ken Burns also called on her talents for his soundtrack for The Civil War. Last year, Carter returned to her work as a leader with the Ella Fitzgerald-inspired Ella: Accentuate the Positive. Featuring Fitzgerald’s former pianist and musical director Mike Wofford, the album had guest appearances from bassist Ben Williams and vocalists Charenee Wade and Carla Cook. With the project, Carter reminded jazz listeners that Ella, 100 years after her birth, continues to provide lessons in eloquence and invention. For this Seattle appearance, the violinist is accompanied by her longtime rhythm section of bassist Chris Lightcap, drummer Alvester Garnett, and pianist Xavier Davis. Restless and ambitious, alto saxophonist, composer, and bandleader Logan Richardson writes, leads, and plays with an expansive musical vision inspired by the likes of Ornette Coleman and Miles Davis. With his stunning band blues PEOPLE, he presents a haunting sci-fi and ‘80s-steeped exploration of his life and roots. Born in Kansas City, Richardson attended the Berklee College of Music and the New School, was mentored by the likes of Billy Hart and Carl Allen, and has played as a sideman with Joe Chambers, Gerald Clayton, Ambrose Akinmusire, and many others. A member of the NEXT collective, he stepped out on his own with his 2006 album Cerebral Flow, gaining critical acclaim with the 2015 release of Shift, featuring Pat Metheny, Jason Moran, and Nasheet Waits. His newest project, blues PEOPLE, “prioritizes theory over practice,” enlisting “rhythm aces mostly from around Kansas City” (NPR). The group includes: bassist Dominique Sanders, a versatile, up-and-coming player whose breadth of experience includes work with Willie Nelson, Roy Hargrove, Talib Kweli, Dave Matthews, Clark Terry, and others; drummer Ryan J. Lee, who studied under saxophonist Bobby Watson, and was a participant in the 2014 Betty Carter Jazz Ahead program under the direction of Jason Moran; and Ukrainian-born, Berlin-based guitarist Igor Osypov, who traces his musical roots to rock and punk, but is a graduate of the Jazz Institute of Berlin where he was a pupil of Kurt Rosenwinkel. The conversion led to her enrollment and graduation from the Thelonious Monk Institute at the New England Conservatory, where she excelled thanks to her inspired, newly acquired love. She continued to open eyes and ears by winning the prestigious Mary Lou Williams Jazz Piano Competition at the Kennedy Center, and then settled in New York City to perform with the likes of Ron Carter, Wayne Shorter, and Wynton Marsalis. Sung has since released six highly acclaimed albums, with Anthem For a New Day (Concord, 2014) topping jazz radio charts and confirming her jazz credentials. Her deft touch and ability to direct musical imagery with her melody-inspired improvisational approach reflect her bridging of two distinct musical worlds. Sung’s solo performance powerfully displays her artistry and imagination. Rather than recoil at the threat of exposed vulnerabilities, she dares to explore the nuances of her style with grace and imagination. Helen Sung has ascended to the heights of the creative spaces of jazz, much to the delight of her ever-increasing audience. Born and raised on the South Side of Chicago, trumpeter Marquis Hill invigorates jazz with his classical cool with urbane flair. Winner of the 2014 Thelonious Monk Institute Trumpet Competition, Hill was mentored by some of Chicago’s finest, finding his own voice where post-bop meets hip-hop. His debut with the Marquis Hill Blacktet, 2016’s The Way We Play, was “a definitive introduction” (JazzTimes) of a career bound to get only better. His newest album, Meditation Tape, is a collaboration with rappers King Legend and Mic We$t, and combines hip-hop, jazz, R&B, and the blues. So too rocks the rest of the Blacktet, including Braxton Cook (sax), Joel Ross (vibes), Jeremiah Hunt (bass), and Jonathan Pinson (drums). Cook, a graduate of Juilliard, toured with trumpeter Christian Scott while still in school. A singular voice on the saxophone, he has played with the likes of Wynton Marsalis, Christian McBride, Jon Batiste, and Robert Glasper. He has also recorded prolifically, and the follow up to his acclaimed solo release Somewhere in Between (2017) is due this year. Joel Ross is “a bright young vibraphonist on his own rocket-like trajectory” (New York Times). Having recently completed a two-year fellowship at the Brubeck Institute in California, Ross’s CV lists gigs with Herbie Hancock, Gerald Clayton, Christian McBride, and others; his own group, Good Vibes, also releases its debut this year. Along with the up-and-coming bassist Jeremiah Hunt, who also cut his teeth on the Chicago scene, the Blacktet includes drummer Jonathan Pinson, a graduate of Berklee and the Thelonious Monk Institute of Jazz Performance at UCLA who has toured with Wayne Shorter, Herbie Hancock, and Ambrose Akinmusire. The Seattle area’s high-school jazz culture has become a national phenomenon, culminating in frequent recognition at the prestigious Essentially Ellington competition at Lincoln Center in New York. Much of that accomplishment has come from the programs at Garfield and Roosevelt High Schools in Seattle, led by Clarence Acox and Scott Brown, respectively. But just north of the King County line, the program at Edmonds-Woodway High School under the baton of Jake Bergevin, has been making some noise of its own as a five-time finalist at the heralded national high-school competition founded by Jazz at Lincoln Center director Wynton Marsalis. For this performance, Bergevin welcomes pianist Helen Sung (see October 8, above) to perform with the band. The pianist, a force of nature in a big band, won the Mary Lou Williams piano competition in 2007 and since then her career has skyrocketed with performance and recording credits with the likes of Wayne Shorter, Ron Carter, Regina Carter, Terri Lynne Carrington, and the Jazz at Lincoln Center Orchestra. She has also worked extensively with young musicians as an associate professor of jazz piano at Berklee College of Music. This performance celebrates the continual replenishment of jazz by young musicians with fresh ideas and boundless passion for the art form. The accomplishment and distinctiveness of Seattle’s contribution to the art form is prominently on display, prompting hope for the shape of things to come in the decades ahead. Jovino Santos Neto, this festival’s featured Resident Artist, appears with fellow Brazilian pianist Jasnam Daya Singh, with whom he received a Latin Grammy nomination for best instrumental album. Jasnam Daya Sing, a noted composer and concert pianist, is a perfect foil for the similarly masterful Santos Neto. Jovino and Jasnam are both natives of Rio de Janeiro. They speak with the same accent, whether chatting in Portuguese or communicating musically behind a pair of grand pianos. Both migrated to the United States: Jasnam to California in 1987, and Jovino to Seattle in 1993. It would make sense, then, that if ever there were two pianists who could successfully take on the task of creating substantive music in a piano duo setting, it would be these two. Four hands on two keyboards can produce a variety of challenges. It is as if the two musicians have an entire symphony orchestra at their collective fingertips. 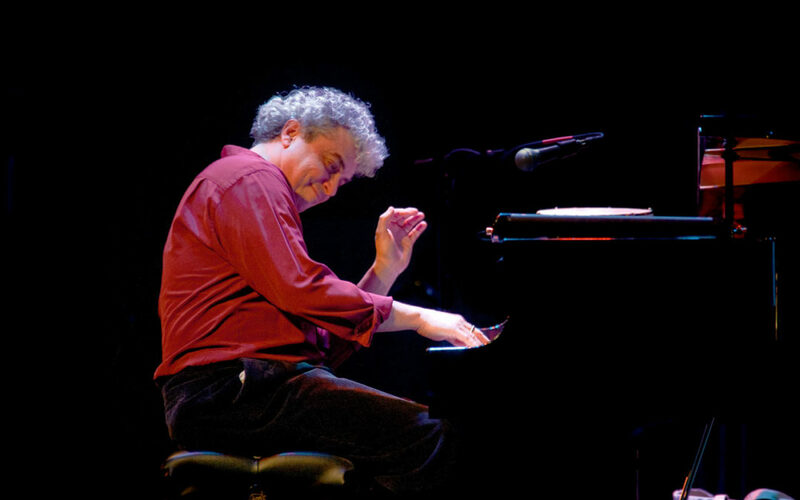 Having the artistic sensitivity to utilize the ebbs and flows of the music without overplaying, or compromising the musical thoughts of your partner, is indeed a skill most pianists never have the opportunity to explore in a performance setting such as that provided for this concert on Jovino’s home turf at Cornish. The cultural and musical ties between Jasnam and Jovino promise to provide music that is organic and rich in spontaneity. Whether playing originals or music from Brazilian masters Hermeto Pascoal and Antonio Carlos Jobim, the evening promises lyrical, vibrant sounds, rich in the dynamics of the history of Brazilian music. Jovino and Jasnam are no strangers to this format. They recorded a live duo concert at the prestigious Caramoor Music Festival in New York, which earned them a Latin Grammy nomination in 2008 for Best Latin Jazz Album. In this reunion, festival patrons in Seattle will have the rare opportunity to see these two transcendent Brazilian musicians create new sounds speaking musically in their common Carioca accent, in the intimate PONCHO setting. Brooklyn-based saxophonist Noah Preminger’s prodigious talents first came to broad attention when he won DownBeat’s Rising Star Best Tenor Saxophonist; he has since released 12 critically acclaimed albums. On Inauguration Day 2017, Preminger released his imaginative essay, Meditations on Freedom, as a musical protest against dark and unfortunate developments in America. In 2018, he issued The Chopin Project, an ambitious interpretation of the piano genius, with the newly formed Dead Composers Club. Co-founded with drummer Rob Garcia, the group plans annual releases of deceased composers’ works. For his Seattle performance, he lands with a quartet featuring trumpeter Jason Palmer, bassist Kim Cass, and drummer Dan Weiss. Opening: Seattle-based saxophonist Kate Olson is a musical pilgrim constantly in search mode. Whether playing straight-ahead jazz subbing with the Seattle Repertory Jazz Orchestra or exploring interstellar environs in her duo Syrinx Effect with trombonist Naomi Moon Siegel, she continually explores and probes, adding layers of new sound to her musical voice. She brings her new Electric Quartet to the festival stage, featuring keyboardist Tim Kennedy who has been making musical waves in the city as pianist with the Thomas Marriott Quintet and in his residency at Tula’s Jazz Club. Bassist David Dawda and drummer Brad Gibson both are noted not only for their virtuosity, but also for their expansive musical versatility. Together, this band is an ideal vehicle for Olson’s original form of expressionism. Though a growing layer of condominiums and new construction may sometimes obscure it, the Seattle spirit still shines—or, more appropriately, burnishes—with the rowdy spirit of its world-famous independent music scene of the ‘80s and ‘90s. “Denio’s voice alone could have made her reputation,” the Seattle Times writes of the Seattle Jazz Hall of Famer and founding member of The Tiptons, Kulture Shock, and Tone Dogs. The musical autodidact and multi-instrumentalist Amy Denio moved to Seattle in 1985, playing as the second drummer for the Entropics. Her affable humor and musical craft (she had studied on saxophone, accordion, and guitars) brought her into the orbit of underground rockers, North Indian classical musicians, choreographers like Pat Graney and Cheronne Wong, the Austrian trio Die Resonanz Stanonczi, and a host of artists worldwide. The music she has made during her tenure in the Emerald City thus carries a plethora of influences and ideas, all aligned with a playful ingenuity that is uniquely her own. And though her CV reads like a cut-up of DownBeat and Life magazines, Denio has also put a wealth of intuition, experience, and quirk into her own projects. Her first release on her own Spoot label, 1985’s cassette No Bones—a suite of avant-jazz close only to Carl Stalling in its eclectic energy—marked a portentous beginning of her solo career. Endeavors such as 2017’s The Big Embrace mark her additional skills not only as a wide-thinking composer, but also as a producer and arranger. This festival, Denio will step out at the city’s improvisation haven, the Chapel Performance Space, for a solo concert drawing on her wealth of world and out-of-this-world abilities and experiences. For any listener who thinks that the enlightening edge of grunge has been lost in today’s polish and accomplishment, they’d be remiss not to spend a night in Denio’s expanding universe. A versatile musician whose talents are expansive, Elena Maque is a composer, saxophonist, and vocalist who explores classical, jazz, funk, and soul music. Her strength is in melding all these skills and influences into sincere musical narratives. She hails from St. Petersburg, Russia, where she graduated from the Mussorgsky College of Music, and became a member of the jazz big band led by Gennady Golshtein. Her move to the US, in particular Seattle, led her to explore different musical avenues. Her reputation has grown as a dynamic and assured entertainer whether playing hip-hop inflected post-bop, interpreting Russian ‘60s hits in bossa nova style, or singing jazz standards. Maque leads two ensembles, Maquattack and the Elena Maque Quartet, and in 2017 she, along with her partner, drummer D’Vonne Lewis, began an art project known as SoulCanvas to promote local musicians. Spirited and devotional fervor runs through the music of Subtle Degrees, the saxophone-drums duo of Travis Laplante and Gerald Cleaver, and of pianist Wayne Horvitz’s Snowghost trio. Having long established their synergy previously as a unit with saxophonist Michael Formanek, Laplante (saxophone) and Cleaver (drums) approach their music with a remarkable reverence. A staple of the NYC scene, Laplante leads the acclaimed sax quartet, Battle Trance, and has played with the likes of Peter Evans, Darius Jones, and Mat Maneri. Son of drummer John Cleaver, Gerald Cleaver now lives in New York, where he has led numerous groups and played with Hank Jones, Kenny Burrell, Roscoe Mitchell, Craig Taborn, and Ellery Eskelin, among others. Subtle Degrees’ debut album, A Dance That Empties, based on a sprawling but precisely measured composition, was written by Laplante on commission from the Brooklyn performance space Roulette. Long based in Seattle but in demand around the country and the world, pianist and composer Wayne Horvitz first came to wide attention in the avant-jazz world on the New York downtown scene of the ‘80s and ‘90s. His newest project began in 2015, when producer Brett Allen offered him time to record in his state-of-the-art studio in Whitefish, Montana, “Snowghost.” With a handful of recent compositions, Horvitz invited Royal Room regulars, local lion Geoff Harper (bass) and firstcaller Eric Eagle (drums). Textural and contemplative, the music presented by this year’s release, The Snowghost Sessions, will enchant. Samantha Boshnack is a musical visionary in a very real sense. Her writing always leads the listener along a visual story line projected as a musical narrative. Her previous two projects told the heroic story of Nellie Bly, and united the sounds of five continents in five concertos. Festivalgoers will witness her latest project, Seismic Belt, a project that interprets life, culture, and cohabitation around the Ring of Fire. Boshnack wrote the eight-movement piece while in residency at 18th Street Arts through their annual Make Jazz Fellowship in Los Angeles. The Herb Alpert Foundation sponsors the award to support promising, emerging composers; other recipients have included Marquis Hill and Tomeka Reid. This performance is the Seattle debut of Seismic Belt, and features a collection of Seattle-based players. Pianist Alex Chadsey has been a mainstay of Boshnack’s projects, as has drummer Max Wood. Saxophonist Chris Credit will play tenor and baritone saxophones, creating a striking balance with violinist Begin Scarseth and bassist Troy Shiefelbein. Lauren Elizabeth Baba will make the trip up from Los Angeles and join on both violin and viola. In March 2019, the live recording of the final LA concert will be released on Orenda Records. While prolific as a composer and ever imaginative in conceiving her work, Boshnack doesn’t perform live all that often, or rather, as often as the jazz community at large would like. In many ways, this performance represents a high-water mark for this project, performed in her chosen home city, in the shadow of Tahoma in repose. Now based in Seattle, Marina Albero, master of the piano, vibes, and psalterium (hammered dulcimer), has been touring the world since childhood in her Barcelona family band. In her early years she studied in Barcelona’s Conservatory (El Bruc) and later in La Havana (ISA), where she completed her classical piano degree. Influenced by many different musical styles such as jazz, flamenco, early music, and Andalusian and Latin sounds, she composes and improvises with a rich personal language. Albero has played and recorded with many well-known artists, including L’Arpeggiata, Chano Dominguez, and Pepe Habichuela. She navigates effortlessly among Spanish, Cuban, and jazz styles, coloring her improvisations with her distinctive palette. She first appeared in Seattle playing vibes in a duo setting with pianist Chano Domínguez in 2014. With her fiery energy, Albero has added to the local music scene and has been much appreciated as the leader of the Marina Albero Project. Tonight, she plays originals and works by the Spanish composer Federico Mompou. She is joined by Seattle favorites Jeff Johnson on bass, Jeff Busch on percussion, and D’Vonne Lewis on drums. Tigran Hamasyan was just 19 years old when he won the Thelonious Monk Institute’s jazz piano competition in 2006, and since then he has steadily evolved into one of the most talked-about and dazzlingly talented pianists on the global jazz scene. Integrating influences as varied as minimalism, jazz improvisational structures, contemporary classical music, and rock textures, and stitching it all together with a profound immersion into the varied musical traditions of his native Armenia, Hamasyan is forging an iconoclastic path defined by free-ranging inventiveness and surprise twists and turns. Fellow pianists such as Herbie Hancock, Brad Mehldau, and Chick Corea have all sung his praises. Corea, with whom Hamasyan shares a certain rhythmic precision and clarity of concept, could be heard as a touchstone. Hamasyan is a pianist of similarly impeccable melodic instincts and sensitive touch. By the age of three, spurred on by a supportive and musically eclectic family upbringing, Hamasyan was picking out melodies from records by artists as varied as The Beatles, Louis Armstrong, and Led Zeppelin. At the age of 10, he was studying jazz formally, and in his early teens had already begun integrating Armenian melodic and rhythmic textures into his musical conception. His frequently sublime recorded work has integrated all these ideas and more: Atmospheres on the ECM label features Hamasyan in a sensitively improvisational group setting, accompanied by trumpeter Arve Henriksen and guitarist Eivind Aarset. An Ancient Observer focuses on Hamasyan’s piano playing, but blends in subtle vocalizations as well as sonic and electronic manipulations. Hamasyan’s latest release, For Gyumri (named after his native town in Armenia) is largely a solo piano effort. As much a composer as an improviser, Hamasyan often blurs boundaries: the distinction between improvisational and written sections is often delightfully difficult to ascertain. Intimate in mood and with a touch of introspective melancholy, For Gyumri provides a hint of what we can expect in his Earshot appearance: an opportunity to hear in a distilled, solo piano format Hamasyan’s truly global blend full of soul, fire, tenderness, and hypnotic complexity. Trumpeter Adam O’Farrill, who graced the Earshot stage in 2016 with Rudresh Mahanthappa’s Bird Calls band, returns with his modern, eclectic, word-tradition-inflected band, including Chad Lefkowitz-Brown (tenor sax), Walter Stinson (bass), and brother Zach O’Farrill (drums). If the name O’Farrill rings a bell, that’s because the trumpeter traces his lineage to the legendary Afro-Cuban composer Chico O’Farrill, father of the pianist Arturo O’Farrill, who surrounded his Brooklyn-born son with the life-lasting joy of music. Aside from his award-winning work with Mahanthappa, O’Farrill’s recent accomplishments include playing on Arturo O’Farrill’s Grammy Award-nominated Cuba: The Conversation Continues, working with the experimental Israeli trio Kadawa, and appearing on Finnish guitarist Olli Hirvonen’s debut album, New Helsinki. He has played with the likes of Mulatu Astatke, Steve Lehman, and Vijay Iyer. A native of Ithaca, New York, Walter Stinson is a bassist on the rise. A student of Bernie Upson, George Reed, and Scott Colley, he has collaborated with Kevin Sun and Onyx Collective, and made his debut as a leader at Jazz Gallery. With a quickly developing compositional voice of his own, he is of a piece with the O’Farrills. Born in Elmira, New York, Lefkowitz-Brown is quickly establishing himself as a voice to be reckoned with. A prodigy mentored by George Reed, Lefkowitz-Brown studied at the Dave Brubeck Institute, playing regularly with its namesake, and has since toured worldwide with the likes of Clarence Penn, Ron McClure, and others. On his most recent album Onward, he “displays a fierce drive, an assured urgency and an up-from-the-gut power” (All About Jazz). This is a quartet sure to thrill—Adam O’Farrill draws from a rich heritage in Afro-Cuban music and the classics, but is a modernist at heart.